Abbie makes her way through the fog, while in the distance, someone can be heard singing, You Are my Sunshine. Suddenly, Abbie comes across a figure sheathed in black robes. Abbie recognizes the figure as her mother Lori and Lori turns and says, "Abigail demons," causing Abbie to wake up. A very sick Ichabod arrives, determined that since he fought with dysentery, he can work with a cold. Abbie hands Crane a bottle of medicine, instructing him to take the pills, drink a lot of liquids and head back to bed. Ichabod struggles with the clearly child proof bottle and Abbie is forced to open it for him. Crane points out that he is not the only one dealing with fatigue because he found Abbie sleeping but Abbie counters, saying that she was up late doing research. Abbie explains that in her dream, she was back in purgatory running from Moloch, when she ran into her mother, who was singing a song she sang to her and Jenny as children, before warning Abbie about demons. Crane points out that Moloch sent demons to torment Lori before she died and Abby agrees that this explains why Lori committed suicide but not why she has been dreaming about Lori every night this week. Abbie covers Crane with a blanket and then gets a call from Reyes. Crane stands to head to the precinct with Abbie, but is told that he is not going anywhere. Reyes informs Abbie that there have been three deaths, all by suicide at Tarrytown psychiatric. The issue is that there are normally no more than one or two suicides a year. Abbie asks what the hospital staff has to say, and is informed by Reyes that the hospital staff are the ones who have called in the police. Abbie questions why she was brought in on this case and Reyes says that Abbie helped bring down a satanic cult, which proves that Abbie can be trusted. Abbie brings up the fact that Reyes knew her mother and that Lori killed herself in the hospital. Reyes calls it personal incentive to find out what is behind the suicides. Reyes adds that had she given this case to someone else, Abbie would not have given her a moment's peace. Jenny and Abbie head to the hospital and Jenny warns Abbie that the hospital is filled with a lot of pain - largely the kind which cannot be cured. Jenny notices that they are being watched by Walter. When Walter starts to make his way over to the sisters, Nurse Lambart is quick to grab his arm, saying that it is time to get him back to his room. Nurse Lambart greets the sisters pleasantly and Abbie says that they are going to start their investigation with Captain Irving. Well, at least it's nice to know that Abbie remembers that Irving is alive. Frank tells the Abbie that he knew the first suicide - Nelson from group therapy. Frank explains that Nelson used to sell aluminum siding before he came home and beat his neighbour half to death. Franks adds that Nelson had been fighting paranoid delusions for years. Abbie questions if Nelson became overwhelmed by his delusions but Frank is quick to say that Nelson was taking his medication regularly and had made major growth in group. Jenny questions if Nelson relapsed, adding that she had seen it before. Franks says that Nelson had found God and organized a hospital prayer group. Abbie points out that none of the suicides seem motivated and questions if Frank had anything to do with it and Franks says no but that he doesn't blame Abbie for asking. Frank gets a vision of talking to Parish and learning that to regain his soul, he must take a life. Frank makes it clear that his soul belongs to the horseman and adds that for now, he is in control of his actions. Frank says that he did this to protect Lacey and would make the same choice if he had to. Abbie promises to get get Frank out of there and asks for his help. How many times is Abbie going to dangle that carrot in order to get Irving to do as she wishes? Jenny and Abbie are now looking over the CCTV from the hospital and Jenny points out that there is nowhere in the hospital anyone can be without being watched. Abbie comments that she cannot imagine what it was like for Jenny and Jenny simply explains that you learn to deal with the abuse and being surrounded by misery. Jenny adds that Lori prepared her for it. Jenny talks about visiting Lori in the hospital because she wanted to have a moment with her but instead, she watched as orderlies dragged Lori away. Jenny asks Abbie what she is trying to find there because the case will not change what happened to their mother. Abbie reveals that for the longest time, she worried that she would end up "crazy" liker her mother and then when Jenny was brought to the hospital, she thought that she was next. Abbie adds that she wants to understand why she was chosen to become a witness. Jenny finds the video of Nelson's room on the night of his death. Abbie uses the night vision overlay to get a better view of the video and the sisters see their mother standing in the corner. Back at the archives, Crane questions if Abbie is certain that the woman she saw in the video was indeed her mother. Abbie responds that Jenny took the video to be analysed but she is already certain that it was indeed her mother. Crane is still sick and grumpy. Abbie goes through the list of therapies her mother received and Crane points out that the treatment didn't work because Abbie's mother saw real demons. Abbie reveals that she has been thinking about her last memories with her mother but says that at the time, Lori seemed crazy. The scene shifts to young Jenny and young Abbie coming home. Lori screams at her children when she learns that they took the bus home because she had instructed her children to take a specific path. The children say that they wanted to talk to their friends but Lori continues screaming that the people they think are their friends might not be. Lori hugs her girls and they say in unison, "eyes open, head up, trust no one." In the present, Crane tells Abbie that he is sorry and that Lori clearly meant to protect them. Crane then suggests that if demons forced Lori to take her own life, Lori could have been brought back by the same demons to force others at Tarrytown down the same path. Abbie points out that Lori died fifteen years ago and questions why she would choose now to come back, adding that Lori is killing these people by forcing them into the same death she chose. They are interrupted by Hawley, who delivers maps and books from the cabin. Crane is not pleased that Hawley was called in for help, adding that he is more than capable of retrieving whatever materials the investigation requires. Hawley hands over some matzoh ball soup to Crane and he is duly impressed. Crane explains that he has an idea why Lori would return at this moment, pulling out his original copy of Washington's map of the area. It seems that Tarrytown was built on a pacific ley line and that means that Moloch may have conjured Lori to get under their skin. Abbie points out that this means that Katrina has been unable to kill Moloch. Ever defensive, Crane points out that killing a demon is not an easy assignment and Abbie clarifies to point out that they haven't heard from Katrina. I guess she ran out of love letters to send. Crane, again defensive, questions if they should seek out Katrina, thus exposing her as a spy to their enemies. Crane sits in a huff and Abbie explains to Hawley that Ichabod will be fine after he gets some sleep. Hawley brings up what Abbie found on the video and Abbie says that she has to get back. Hawley makes Jane Austen reference, saying that he would be happy to chip in. Abbie snarks about Hawley's awareness that Moloch is alive and that Hawley might need them, if there really is an apocalypse. Hawley reminds Abbie that she is the one who called him. They both look over to see Ichabod falling asleep in his chair and Hawley admits to drugging Ichabod. I'm team Hawley on that one. Parish looks down on baby Moloch and Katrina makes it clear that she will not cooperate with whatever Henry has in mind. Katrina asks about the child and Henry says that the babe is an orphan, as he was for a time. Katrina asks if the child is there to torment her and Henry snarks that it is telling that a needy child would upset Katrina. A defensive Katrina stands, explaining that this is not what she meant and asks what Parish plans to do with the child. Henry says that he only wishes great things for the babe. Henry encourages Katrina to pick up the child and Katrina resists, saying that she doesn't wish to disturb him. Henry points out that all children need nurturing, particularly those who have been abandoned. Henry adds that Katrina's history has been lacking and questions if Katrina will forsake the child, as she once did him. Katrina picks up the baby, as the child coos and turns into a demon on her shoulder. Katrina gets a flashback to looking at baby Henry. In the present, an emotional Henry quips that Katrina possess the maternal instinct after all. Jenny, Hawley and Abbie debate how to handle Lori. Hawley wants more firepower, Jenny argues that Tarrytown turned Lori into a monster and Abbie points out that Lori is her mother. Hawley suggests that they can stop Lori and help her find some peace. Jenny catches, Walter on the CCTV with a piece of broken glass in hands, and realises that Walter is going to hurt himself. Hawley, Abbie and Jenny arrive just in time to stop Walter from slitting his wrist. Abbie looks into the corner and see her mother and calls out. By the time Jenny turns her head, not only is Lori gone but so is Abbie. Abbie finds herself alone in the hospital, with the lights barely functioning. Abbie makes her way cautiously through the halls and when she sees her mother, Abbie quickly pulls her gun, only to have a light fixture fall on top of her. Abbie gets back on her feet and this time sees Lori directly in front of her. Lori tells Abbie that it is not safe for her. Nurse Lambart shows up behind Abbie, startling her, saying that this place can do things to people. Abbie says that she is fine and Nurse Lambart asks how Abbie ended up here because the wing hasn't been used in years. Abbe explains that she must have taken a wrong turn and heads away, looking for an exit. Hawley and Jenny agree to separate to look for Abbie. In the halls, Jenny hears Lori's voice and instructs her mother to stay away from her. When Jenny turns around, she finds a message written on the door but is distracted when Abbie arrives. Jenny shows Abbie the code written on the glass and Abbie recognizes it as a code used by hospitals to designate patient video sessions. Abbie explains that their mother is trying to tell them something. Katrina puts baby Moloch down and examines herself in the mirror. She sees that the skin on her neck and shoulder is quite a bit darker. Katrina heads outside and picks a blossom off a tree. At the archives, Abbie pulls out a cd, explaining that she asked Hawley and Crane to give them some privacy. Jenny is concerned about watching it but Abbie says that they need to know what it all means after the note Lori left. Jenny says that as much as she loved their mother, most of her memories involve being scared. Abbie points out that they now know the reason Lori was unstable and that maybe this will help them understand more. Abbie suggests that they do this together like they used to when things got bad. Abbie puts in the CD and they watch as Lori is in a session, in a straitjacket, talking about how demons followed her there. The sisters hold hands, as on the tape, Lori is insistent that she has to protect her daughters. Lori says that Nurse Lambert wants her to do something because she is not a good mother. Abbie realises that the nurse they saw this morning was named nurse Lambert and that she was with Nelson before he tried to kill himself. On the tape, Lori is told that there is no nurse Lambert and that Nurse Lamber is a delusion she created. Lori shakes her head no, absolutely insistent that Nurse Lambert is real. At the hospital, Nurse Lambert is with Frank, saying how much she loves helping people and that everyone has so much hurt bottled up inside. On the tape, Lori continues to insist that Nurse Lambert is real. Abbie gets a flashback to talking to Nurse Lambert about speaking with Frank. In the hospital, Nurse Lambert hands Frank two red pills, saying that they will help with the pain. Franks swallows the pills, as Nurse Lambert watches. Frank begins to hear voices and he turns on multiple taps and sits in a tub. He keeps hearing a voice say that it's time. Frank is drowning by the time, Abby, Jenny and Hawley find him. They pull Frank out of the water, while he questions why they saved him. Abbie then gets a quick vision of Lori. Later, Abbie sits at Frank's bedside and asks him how he is feeling. Frank admits that he has had better days and that Nurse Lambert gave him some pills and then suicide started to seem like the only thing to do. Abbie tells Frank that the tox report reveals that Frank was on some heavy drugs, which opened his mind to suggestions. Abbie explains that while they don't know who Nurse Lambert is yet, she is someone they are going to stop. Abbie instructs Frank to rest because they have this all under control. Frank then thanks Abbie and she leaves. Back at the archives, Abbie looks up Nurse Lambert with Hawley and Jenny at her side. It seems that Lambert was known as the killer nurse because back in the 1950's she was responsible for the deaths of 21 patients. They learn that Lambert fed her patients a drug cocktail, which weakened them to the suggestion that they should take their own lives. Apparently, Lambert saw her victim's as mercy kills. They learn that Lambert was actually caught at Tarrytown and then executed in the electric chair in 1959. Abbie suggests that Lori is trying to stop Lamber from killing more people, adding that Lori's final note said, "I fought." Abbie wonders if this is still Lori fighting but Jenny is incredulous about the idea that Lori knows how to stop Lambert. The sisters are now in the old wing, in the room where Lori spent seven months in solitary. The sisters begin to chip away at the plaster on the walls and reveal a drawing of themselves as children with the words, "You are my sunshine." Jenny gets a flashback to herself as a child handing her mother a drawing of them as a family. The song, "You Are My Sunshine is playing in the background when Jenny notices a peculiar smell. Yes, Lori had plugged the vent. In the present, Jenny realises that Lori tried to kill her and panics, demanding that she leave. Abbie comforts her sister telling her that it's alright. Lori makes an appearance and tells the sisters that they are not safe. Abbie tells Lori that they know about Lambert and Lori suggests that they use an ancient hex to fight against to the evil spirits. We get a flash to Lori hanging in her room. Lori tells the girls that there is a journal which was passed down by the ancestors, containing powerful magic. Lori starts to hear voices and she screams at her daughters to leave. Lambert makes an appearance, saying it's too late and slams everyone against the wall, before stealing away Abbie. Lori instructs Hawley to find the journal before taking off to find Abbie. Jenny tells Hawley that the journal might be in a storage room in the basement. Abbie regains consciousness to find Lambert telling her that she is just like her mother. Abbie is then strapped to a wheelchair, as Lambert explains that Abbie is a broken spirit and that she gave Lori peace. Lambert questions if Abbie wants to know peace and adds that Abbie's soul is crying out for it. Abbie tells Lambert to go to hell and Lambert begins to push the wheelchair, commenting that Abbie does not have very nice manners. Jenny and Hawley find the journal, which belonged to her ancestor Grace Dixon. They flip through the book and find an invocation from west Africa to expel witch doctors who have risen from the grave. Abby screams, telling Lambert to stay away from her and Lambert talks about how Lori resisted at first, as we get a flashback to the past, with Lori being strapped to a bed screaming not to be left in the room. Lambert says that people need an angel of mercy to help them cross over and that Lori finally surrendered. We get another flashback to Lori looking at a noose. In the present, Lambert holds the same pills she gave to Frank and tells Abbie that it is her turn. Abbie is forced to open her mouth but Lori grabs Lambert from behind screaming that she is to get away from Abbie. In the basement, Jenny begins to say the spell. Hawley instructs Jenny to say the spell again, as upstairs, Lambert throws Lori across the room, demanding that she obey. Lori tells Lambert that she is not scared of her anymore. Wind begins to blow across the basement and the room in which Abbie is tired up. Lambert disappears with a scream. Jenny and Hawley find Abbie and she explains that both Lori and Lambert are gone and that Lori fought for her. Abbie is sad that she didn't get to thank her mother and Jenny suggests that there might be away. In Lori's old room, Crane, Hawley, Jenny and Abbie gather. Jenny pulls out a crystal and lights a candle before indicating for everyone to join hands. Jenny begins to say a spell, summoning Lori Mills. The room begins to shake and Lori makes an appearance. The sisters have tears in their eyes and Lori is shocked at what her daughters grew up to be. Lori admits that she knew that Abbie would be a witness and so Abbie asks why her. Lori explains that there are many things you don't get to choose and that you have to fight. We get a flash to Lori deciding not to kill herself and Jenny, only to find herself trapped in the car with a demon staring at her. Lori crashes through the garage door and pulls away to escape. Jenny realises that her mother saved her and Lori reveals that after she was locked up, Moloch sent Lambert to finish her off, trapping her in Tarrytown ever since. Lori reveals that she watched over Jenny while she was there and did everything she could to protect them both. Abbie realises that this is Lori's purgatory and Lori explains that the journal keeps the secrets hidden in its pages and that Abbie has to find it and win the war. Abbie asks about freeing Lori and Lori tells Abbie that she already did with tears in her eyes. Lori starts to disappear and the sisters beg her not to go. Jenny realises that Lori never stopped fighting and Crane calls it a fitting legacy. Abbie admits that she forgot how beautiful her mother was and the two sisters embrace. Later, Abbie and Ichabod are driving, when Frank steps out into the middle of the road, admitting that he is escaping. Franks explains that as long as he is in Tarrytown, he is a target, pointing out that Abbie promised him that he could trust her before hopping in the care. Katrina works on a potion to send Moloch home, saying a spell. Katrina carries it over to the crib, only to find that the baby is gone. Katrina begins to look around the house, heading downstairs. The baby is now a young boy and he tells Katrina that he is hungry, while holding a loaf of bread. 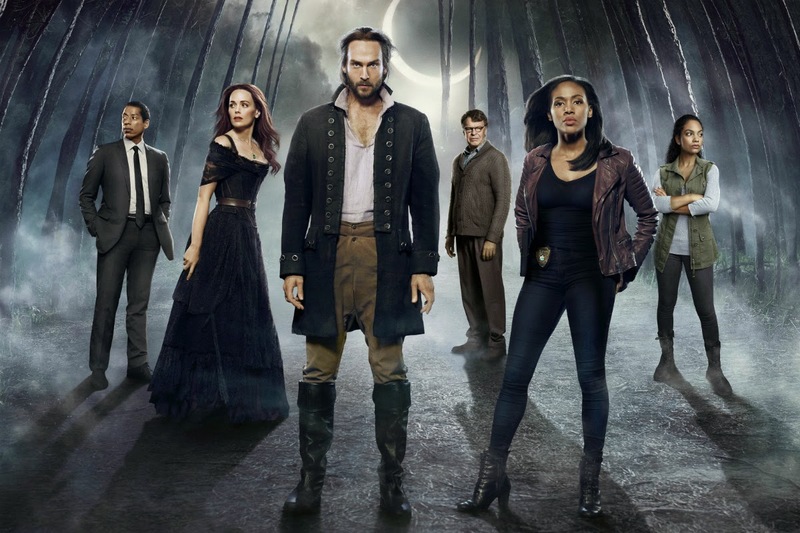 For the first time in a long time, we moved away from #cranewrecked and had an episode of Sleepy Hollow centered on the characters of colour. It was a long time coming. We did however have Crane defending Katrina and though I realise that she is his wife, I find his constant vacillating on her actions boring at this point. The shaming scenes between Henry and Katrina further irritated me. The very idea that Katrina can be redeemed for her so-called bad acts by being a maternal figure to a demon is beyond problematic. To then have Katrina not call her evil spawn out on his shennanigans not only reified the whole fruit of my womb is awesome theme that Sleepy Hollow has been running with the last few episodes, but made it appear as though Katrina believes that she deserves to be shamed. There was a lot of describing the mentally ill people in Tarrytown as not only "crazy" but violent. This is a theme constantly presented by the media though those who negotiate mental illness are far more likely to be a danger to themselves than others. I was particularly disturbed by Nelsan showing progress by creating a Xtian prayer group. Really? No, Seriously. Really? The persistence on calling Lori, "crazy," was also disturbing given that Abbie at the very least is aware of how Moloch treated her mother. I did however liked how the sisters talked about growing up with a mother like Lori and how it impacted their lives. The difficulty caregivers of disabled people experience is often lost in the desire to criminalize those living with mental illness. Further, I liked seeing the sisters together again and this episode brought a real depth to their shared trauma and their reliance on each other as sisters. I further liked the fact that Sleepy Hollow made it clear that without a strong advocate on your behalf, places like Tarrytown can be an absolute horror. In the guise of helping, there can be many violations on the person who is mentally ill.
As for Frank, I was so pleased to see him standing in the road, demanding his freedom. Abbie and Ichabod have made many promises to him and thus far have been content to let him rot in Tarrytown. It's about time that Frank forced them to keep their word to him. Finally, did Lori's ancestor really have to practice Voodoo? It seems like the go to whenever magic from Africa is being discussed, as though Voodoo isn't so much more than woo for Black people. It further ignores the fact that there are various practices coming out of West Africa.